A larger show of prime cattle saw heifers hard to sell, although good bullocks continued to sell at recent high rates and topped the sale at 259.5p for a Limousin shown by A & W J Taylor & Son, Dashwellgreen with heifers selling to 239.5p (x2) both from DJ Garthwaite, Wyseby Hill Cottage. 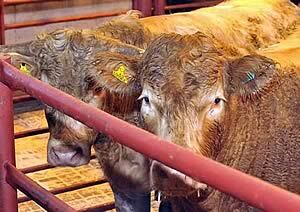 A small show of bulls sold to recent rates topping at 210.5p for a Britsh Blue from AS & CE Coulthard, Justicetown. Cast cows continued to sell well although plainer sorts were slightly easier. Top price of 155.5p for a Limousin cow shown by WH & DA Gass, Nunscleugh..
A smaller show of 2,382 prime lambs was forward to the usual full ring of buyers with a very different attitude to buying sheep compared to last week. All firms keen for lambs with the average levelling out at 190p up some 15p on the week. With Ramadam coming towards an end we hope that the lamb trade is going to level out at a sensible rate for everybody. Top price of 238p per kilo for Beltex from W Gribbon & Co, Waterside and to £102.80 for Texels from Colinton Mains & Roundbush and Charollais from Roundbush. Also today was a prize show and sale for pens of 10 Suffolk lambs which was kindly sponsored by the Northern Counties of England Branch of Suffolk Sheep Society and ably judged by Mr James Thompson. The championship was awarded to a pen of 44kg lambs from local consigner Mr H Fisher, The Beeches which realised £89 to M. Lomax. 2nd prize M/S Gardner, Glebelands 42kg selling at £80 to Dunbia and 3rd prize M/s Longlands, Tonehall scaling 44kg and selling at £84 again to M. Lomax. Thanks to all those who entered sheep for this show. The 525 light weight lambs were short of buyers requirements and more could have been sold to an advantage (what a difference a week makes) sold to a top of £75.80 for Texels from Kirtleton Hill, £72.80 Craig, £71.80 Carlenrigg; Suffolks £70.80, £67.80 Snowsgreen, £66 Sykehead; Cheviot £49.80 Tarnside; Bleu de Maine £67.80 The Firs; Greyface £71.80 Brockewath, £59.20 Old Hall; Blackface £63.80 Park Nook, £57.80 Bowershield; Beltex £71.80 The Firs; Lleyn £62.80 South Bowerhouses. Also weighed this week on a weigh and pay basis were 120 lightweight lambs between 26 and 36 kilos, which are now sought after weekly. A larger show of 4,423 cast ewes and rams was forward to the usual ring of buyers, trade sharper on the week and larger ewes short of requirements. More hill ewes forward with good flesh easily sold, but lean ewes realisation. Top was for Texel rams £126.50 Dashwellgreen, £116.50 Roadside, £114.50 Brantwood; Suffolk x £106.50 Severs, £96.50 Brantwood; Charollais £103.50 Drumgrange, £98.50 Wick; Leicester £80.50 Gall; Blackface £88.50 Bowershield; North Country Cheviot £103.50 Brantwood, £86.50 Marchbank; Beltex £108.50 Wick; Lleyn £86.50 Wick; Oxford £96.50 Roadside; Easycare £54.50 Mossfennan. 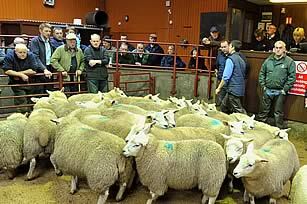 Heavy ewes to £118.50 for Charollais from Severs, £98.50 Roadside, £96.50 Severs; Suffolk £117.50 Mossband House, £108.50 Severs, £100.50 Clackmae; Texel £116.50 East Farm, £114.50 Townhead, £110.50 Crailloch; Bleu de Maine £94.50 Braithwaite Hall; Rouge £69.50 Severs; Halfbred £72.50 Earlside; Greyface £79.50 Wick & Baillieknowe, £77.50 Snowsgreen; Cheviot Mule £86.50, £75.50 Clackmae; Leicester £82.50 Townhead, £80.50 East Farm; North Country Cheviot £72.50 Gospel Hall & Earlside, £68.50 Hartside, £67.50 Brantwood; Beltex £94.50 Tynefield, £84.50 Severs; Roussin £75.50 Roadside; Oxford £74.50, £68.50 Guards; Easycare £52.50 Mossfennan, £49.50 Lowmoorhead. Goats sold to £72.50 Lanehead. Hill ewes to £66.50 for Cheviots from Sykehead, Blackfaces from Bowershield and Herdwicks from Cardewlees. Other Cheviots £54.50 Waterside, £52.50 Snowsgreen; Other Blackfaces £58.50 Bidlake, £57.50 Woodhall & Crowhall; Other Herdwicks £50.50 GoftonFieldhead; Swaledales £54.50 Bullshill, £52.50 Tynefield, £48.50 Kirkland Green; LLeyn £56.60 Wynholm, £52.50 Bridge End.